All languages have words and phrases that are tricky to translate, but some of these unique Japanese words are so perfect, they will leave you wondering why we don’t have the equivalent in English! 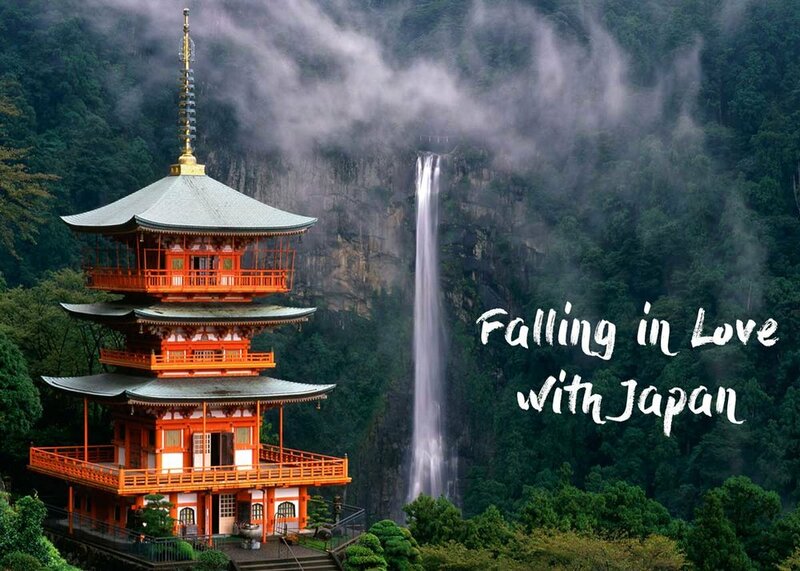 Japan Travel specialists InsideJapan Tours have teamed up with the Japan National Tourism Organization to launch a new series of beautiful videos, Falling in Love with Japan, to bring these captivating Japanese concepts to life. Kuidaore - to eat and drink yourself into ruin - is most often associated with Japan’s foodie capital, Osaka. But it could easily apply to anywhere in the country. Japan has many unique sights - temples, geisha, sumo, Mount Fuji and cherry blossom - but it’s often authentic bowls of ramen, exquisitely rolled sushi and sticky sweet tonkatsu that visitors long for when they return home. From informal street food stalls right up to Michelin-starred restaurants (of which Tokyo boasts the world’s highest concentration), washoku (Japanese cuisine) is so special, it’s recognised on the UNESCO Intangible Cultural Heritage list. Not only is Japanese food delicious, but even the simplest meals can look like works of art. Board a bullet train with a bento box and you’ll see what I mean – with cute little pockets containing perfect portions of different things, a supermarket sandwich will never look the same way again. For a real taste of Japan, spend a night at a ryokan. These traditional inns have tatami-mat floors, futon beds, sliding paper doors and kaiseki dinners - beautifully crafted dishes using only local and seasonal produce. Feeling thirsty after all that? Take part in the ancient art of the tea ceremony, sup sake from dainty cups or order a chilled glass of the finest Japanese beer and raise a toast to kuidaore! The popular Edo-period Japanese art movement ukiyo-e comes from the word ukiyo, ‘floating world’, and e meaning ‘picture’. These woodblock prints reflected a newfound period of prosperity, depicting scenes of entertainment quarters with geisha, tea houses, sumo wrestlers and kabuki theatre, as well as the beauty of the ephemeral with visions of flora and fauna. These days, Japan is home to cityscapes so vast, they sweep you up in a sea of people - an unusual combination of calm amongst crowds and a frenetic blur of neon lights. However, the floating world still rumbles under the surface of modern Japan. Head over to the Extraordinary Story of Japanese Art to learn more, or check out some of the master’s of the woodblock print, such as Hokusai, Hasui and Hiroshige! Have you ever walked under a canopy of trees and seen shapes cast by the sun at your feet? This phenomenon of light filtering through the leaves is so treasured in Japan that it has its very own word: Komorebi. In Japan, hiking is a popular past-time – it is the home to Mount Fuji, after all – and it’s not uncommon for even elderly Japanese people to stride up the steepest of climes with fervour. Over 70% of Japan’s landscape is mountainous, and much of it heavily forested, so perhaps it’s unsurprising that as well as komorebi, there’s also shinrin-yoku, forest bathing. While Japan has countless onsen, natural hot spring baths, forest bathing has little to do with water. Shinrin-yoku refers to bathing in the forest itself: not simply going for a walk, strident or not, but being mindful of the natural environment to improve your health. Many of Japan’s most famous occupations - including geisha, sumo and sushi chefs - require years of hard work, and often hardship, to perfect the craft. While kodawari refers to this sort of dedication, it doesn’t just apply to famous traditions; attention to detail can be practised on far humbler ambitions. Whether you’re working on a factory line or training steadfastly to become the next sumo, you’re engaging in kodawari – perseverance and focus that creates a higher standard for everyone else. Many Japanese traditions require a great deal of patience and attention to detail with complex, detailed rituals. Tea ceremonies are long, drawn out affairs and ikebana (flower arranging) is bound by rules that evoke language and meaning through seemingly innocuous features like height, types, colours and angles. Out of the many things that surprise visitors to Japan, the stark contrast between long-held traditions and super speedy hypermodern technology leaves a lasting impression. Despite a propensity for staggering skyscrapers and inordinately fast bullet trains, ancient Buddhist temples and Shinto shrines are never far away, even in big cities. Onkochishin is a sense of using the past to inform what we do now and achieve in the future. Even today, in such a technologically advanced country, Japanese people respect the wisdom of old, appreciating that we can move forward while learning from what has gone before. Ikigai is particularly profound – it translates to ‘a reason for being’. Everyone needs a reason to get up in the morning, motivated by beliefs and value systems. If there’s a place that epitomises ikigai, it’s Okinawa. Japan’s southernmost prefecture has an extremely high concentration of healthy octogenarians said to be due to ikigai in old age. But find your ikigai when you’re young and you’ll have a whole life packed with meaning. An ikigai needn’t be something big, it’s a journey you find energising, rather than a final destination. Yoisho is more of an exclamation than a phrase: hang out with the locals and you’re bound to hear it more than once. It could be a moment of hardship, like lifting something heavy or getting out of a chair with some difficulty, or a sigh of relief at the end of a long working day. Japan’s unique volcanic landscape has gifted the country with an array of natural hot spring baths. Unsurprisingly, a relaxing dip in the onsen is a popular past-time – sink into its therapeutic waters after a busy day sightseeing… yoisho! If you’re looking for some suggestions of onsens while you’re in Tokyo, check out these 7 hot springs that are great even for the tattooed among us!